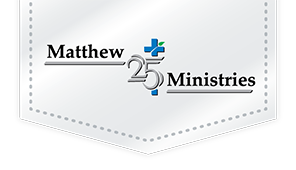 Matthew 25: Ministries, a humanitarian aid and disaster relief organization headquartered in Cincinnati, OH, is offering assistance to furloughed federal workers in Greater Cincinnati affected by the government shutdown. As many as 800,000 government employees nationwide have been affected by the shutdown, which is now in its fifth week. Beginning Thursday, January 24 Matthew 25 will be handing out care packages at their facility in Blue Ash, OH to federal employees. Distributions will take place at Matthew 25: Ministries, 11060 Kenwood Road, Cincinnati, OH 45242 on Thursday, Jan. 24 from 1 PM – 4 PM, Friday, Jan. 25 from 9 AM – 4 PM, and Monday, Jan. 28 from 9 AM – 4 PM or until all kits and products have been handed out. Employees should drive around the side of the facility to the drop-off door and indicate that they are there to receive furlough supplies. Employees must present an ID card as proof of federal employment. For the most current information on Matthew 25: Ministries activities, please visit our website www.m25m.org. Follow Matthew 25: Ministries on Facebook – facebook.com/m25m.org, Pinterest – pinterest.com/m25M, Instagram – instagram.com/m25m_org and Twitter – twitter.com/M25M_org. ABOUT MATTHEW 25: MINISTRIES: Matthew 25: Ministries rescues and reuses more than 16,000,000 pounds of corporate discontinues, misprints, overruns, off-spec, slightly damaged, returned and past season products each year and redistributes them to people in desperate need throughout the US and worldwide. Each year, Matthew 25: Ministries impacts the lives of more than 20,000,000 individuals throughout the United States and around the world. More than 99% of Matthew 25: Ministries’ cash and in-kind donations go toward programs. Matthew 25 is highly ranked for financial performance, accountability and transparency by Charity Navigator (more than 99% of cash and in-kind donations go toward programs) and is accredited by the Better Business Bureau through the Wise Giving Alliance Standards. For more information, or to schedule an interview, contact Joodi Archer or Mary Tignor at Matthew 25: Ministries (513) 793-6256 or visit www.m25m.org.